I scream, you scream, we all scream for ice cream! Today is National Ice Cream Sandwich Day and, with the record heat we’ve had here in Chicago, I plan on celebrating all week long! And nothing quite says summer like an ice cream sandwich. Whether it’s the traditional chocolate graham sandwiches or the upscale chocolate chip cookie sandwiches, a cool and refreshing ice cream sandwich just hits the spot every time. And today, I have a fun way to celebrate National Ice Cream Sandwich day with just three ingredients: cookies, ice cream, and sprinkles…can’t go wrong there! These cute little sandwich bites are great for any season and are sure to please kids and adults alike. To start, use a cookie dough scoop to scoop out as many ice cream balls as you’d like. Place them on a cookie sheet and pop them in the freezer for about 30 minutes. This will harden them a little bit and make them easier to work with. Once your ice cream balls have hardened, sandwich each ball between two Vanilla Wafer cookies. Roll edges of cookie sandwich in sprinkles and enjoy! Great for those days that are just too hot to be outside, this is a fun project for kids to help with and a tasty treat for any summer birthday party or BBQ. These are so cute and so fun to eat! There’s no baking required, just freezing! 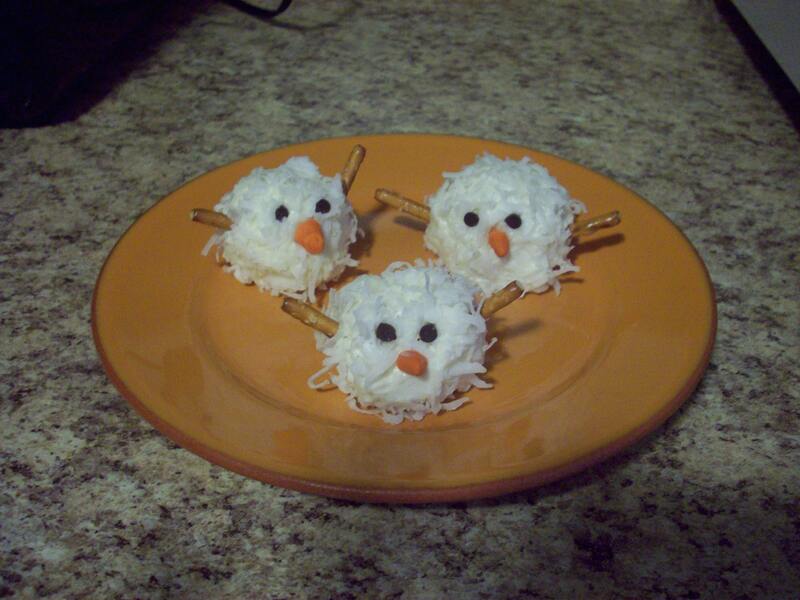 Serve with a hot cup of cocoa after a fun day sledding! 1. Pour about half a bag of coconut into a bowl. Set aside. 2. Place wax paper on a baking sheet and put in freezer. 3. Let your vanilla ice cream sit for about a minute to soften. Scoop balls of ice cream (one at a time) into the coconut and roll around to coat. 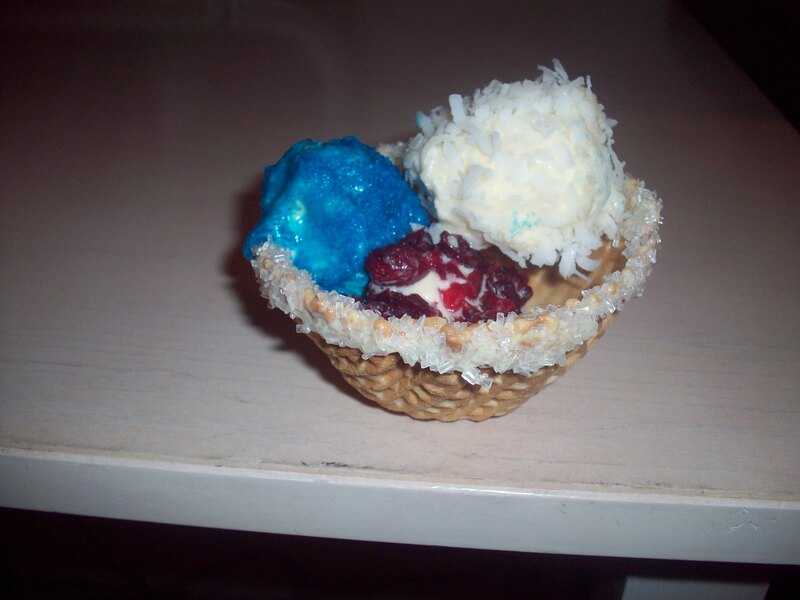 You can also use your fingers to shape the ice cream into a ball as you coat it with coconut. Once it’s fully coated, put it on the pan in the freezer to refreeze. Repeat for as many snowmen as you want to make (you may need to take a break and let your ice cream refreeze before making more snowman balls). 4. After about 5 hours, stick mini chocolate chips in the ice cream for eyes, pretzels for arms, and the Starburst candy or fondant for the nose (just cut a little piece off and work it into a triangle). For best results, let sit in freezer at least 24 hours before serving. Heavenly and Super Easy Summer Dessert! 1. Make sure your ice cream has been in the freezer for at least 24 hours. 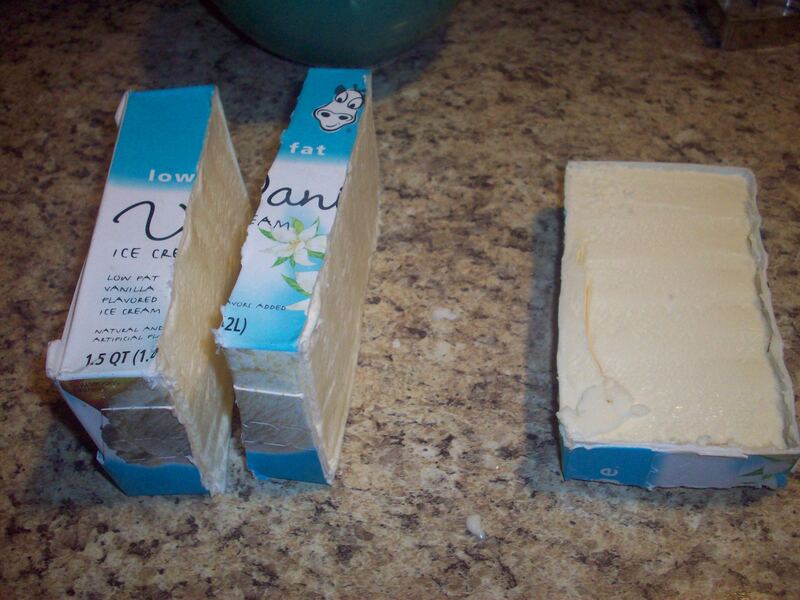 Remove from the freezer and cut the carton off. Place on a tray and refreeze until firm. 2. Bring whipping cream to a simmer. Make sure you watch it carefully, you don’t want it to start boiling. Once the cream is simmering, pour it over chocolate chips. Let stand for 1 minute. Mix until combined and let sit at room temperature until cool, stirring occasionally. 3. Once your ganache is cool, pour it over your ice cream. Refreeze until the chocolate has set. Scatter with shaved chocolate, strawberries, or top with a dollop of whipped cream. Who doesn’t love Klondikes? The crunchy chocolate and soft creamy ice cream marry to create the most wonderful summer treat. I’ve recently seen all different kinds of flavors but you don’t have to stick to those when you would do just about anything for this frozen bar. All you need is your favorite ice cream flavor and the Turtle Shell instant freezing chocolate sauce. To prep, place a cookie sheet in the freezer for about 15 minutes…just to get it cold. If you’d like, you can cover it with aluminum foil or plastic wrap to prevent the ice cream from sticking. Make sure your ice cream has been in your freezer for at least 24 hours. The more frozen it is, the better. 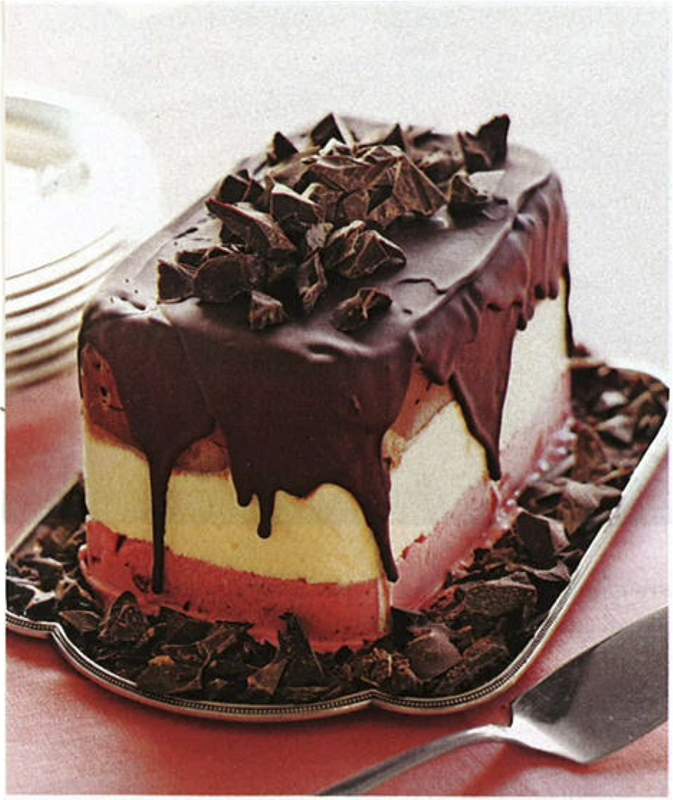 Take it out of the freezer, along with your cookie sheet, and cut the box of ice cream into 1-2 inch strips. Cut your box into strips. 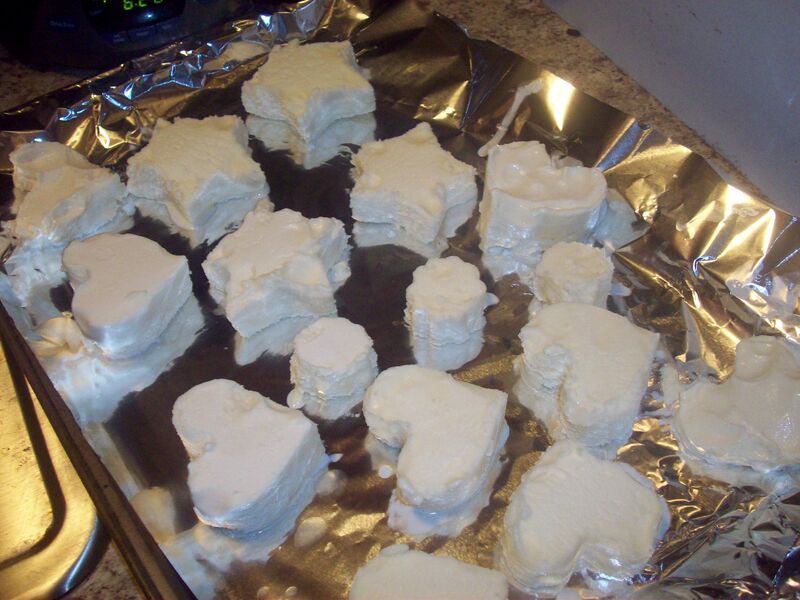 Using cookie cutters, cut shapes out of the ice cream and quickly transfer them to the cookie sheet. If your ice cream starts to melt, put the tray in the freezer and use a spatula to transfer ice cream shapes into the tray in the freezer. Let the ice cream re-harden overnight. When you’re ready to make the shell, simply take your tray out of the freezer and cover each shape with the chocolate sauce. Place it back in the freezer if not being consumed right away. So today’s craft is a food craft…and I wanted to get it out there before this Fourth of July weekend. It’s a breeze to make and a great way to get your kids involved in the kitchen. It can also be adapted for any holiday or occasion. The only problem is that it obviously doesn’t travel well, being ice cream and all, but no worries…I have a way around that, too! Place the coconut, cranberries, and blue sugar in the three separate bags (one topping in each bag). Leave open and set aside. The easiest way to make these little ice cream balls is to make sure your ice cream has been sitting in your freezer for at least 24 hours…so it’s not soft. Cover your cookie sheet with wax paper and place it in the freezer. Using a spoon or small ice cream scoop (or even a melon baller would work), scoop as many ice cream balls as you need. You could even roll them in your hands if they’re not round enough for you. 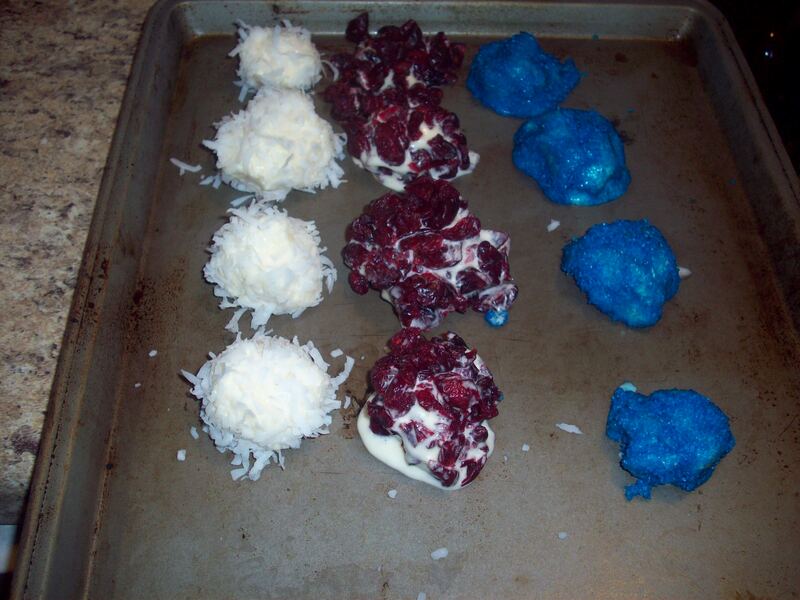 Once you have one ice cream ball, drop it in one of the bags containing coconut, cranberries, or blue sugar. Shake it around until it’s coated and place it on the cookie sheet in the freezer. Repeat and let those little guys sit for at least 2 hours. Let them chill in the freezer! 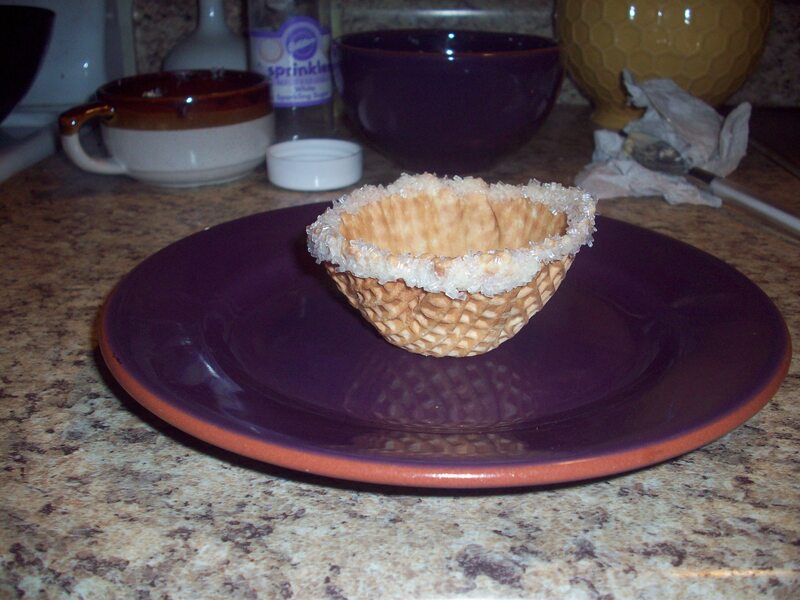 Do this step 15-30 minutes before serving…because the waffle bowls will be hard to store once they’re decorated. If you have to do it ahead of time, stack them carefully and place them in an airtight container or a ziplock bag. When your little guys are refreezing in the freezer, place 2-3 Bakers White chocolate squares in your microwaveable bowl and follow the directions to melt the chocolate in the microwave. Be careful to watch it because every microwave is different. Also, make sure your bowl is wide enough that you can dip the waffle bowl tops into it. Place your candy sugar in a wide bowl and set aside. Again, make sure your waffle bowl can fit inside. Once your chocolate is melted, give it a stir and dip your waffle bowl, top down, into the chocolate…and then into the candy sprinkles. Set aside. Repeat as necessary. Decorated waffle bowls. You can use any topping you’d like. Once your bowls are ready and your ice cream is ready, simply arrange three to four ice cream balls in your waffle bowls and serve. Like I said, you can change the toppings to whatever you’d like and make it workable for any holiday. Not to worry! The same effect can be had by using marshmallows. Simply pick your toppings and follow the directions for prepping…but use bowls or cups instead of bags. Up your white chocolate count to 6-8 squares and make chocolate covered marshmallows, dipping them in the chocolate and then the topping of your choice. MAKE SURE TO LET YOUR CHOCOLATE COME TO ROOM TEMPERATURE OR YOU’LL MELT YOUR MARSHMALLOWS! Use shish kabob sticks to dip your marshmallows into the chocolate and then the topping. Once they’ve been topped, place it on a wax covered cookie sheet and refrigerate until ready to use. You could also use fruit for this, too. Dip and decorate orange slices, grapes, strawberries, or starfruit for a healthy and satisfying dessert! Happy Monday, everyone! I hope all of you had a wonderful weekend! It was a wacky weather weekend here in Chicago, with freak rain/thunderstorms that would last 5-20 minutes and then the sun would come out for an hour or so before it would start raining again. Needless to say, I got a good head start on my next book for this Friday and came upon this recipe while reading. It looked so good that I couldn’t help but pass it along. I haven’t made it yet, but it’s definitely on my summer treat list. Place the ice cream or sherbert, the ice, vodka, and wine in a blender and whirl until it’s thick, creamy, and barely pourable. Transfer it to iced wineglasses, sprinkle on the lemon zest, and serve with small spoons.